The Theo Wanne All in One Feeler Gauge Set includes all sizes needed to accurately measure a mouthpiece tip opening and has both US and Metric numbering. 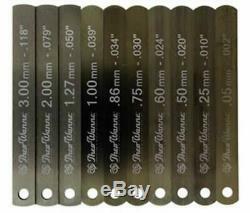 Use these gauges with the Theo Wanne Glass Gauge to measure mouthpiece facings. All in One Set includes: 3.00mm / 0.118" 2.00mm / 0.079" 1.27mm / 0.050" 1.00mm / 0.039" 0.86mm / 0.034" 0.75mm / 0.030" 0.60mm / 0.024" 0.50mm / 0.020" 0.25mm / 0.010" 0.05mm / 0.002". The item "Theo Wanne Feeler Gauges for Saxophone Mouthpiece Facing" is in sale since Thursday, February 7, 2019. This item is in the category "Musical Instruments & Gear\Wind & Woodwind\Parts & Accessories\Mouthpieces". c0m" and is located in Wilmington, North Carolina. This item can be shipped worldwide.